If you're not developing a multi-tenant application, you can skip this section. A tenant is represented by Tenant class. Tenant class can be extended by adding new properties. There is an only one tenant, named Default as initial. Tenancy Name (code name) is the unique name of a tenant. A tenant can be active or passive. If it's passive, no user of this tenant can login to the application. Tenancy name should be unique and not contain spaces or other special chars since it may be used as subdomain name (like tenancyname.mydomain.com. See the section below). Name can be anything. Admin email is used as email address of the admin user of new tenant. Admin user is automatically created with the tenant. We can set a random password for admin and send activation email. When user first logins, he/she should change the password. We can uncheck this to enter a known password. When we create a new tenant, we should select/create a database to store new tenant's data. We can select 'Use host database' to store tenant data in host database (can be used for single database approach) or we can specify a connection string to create/use a dedicated database for new tenant. ASP.NET Zero supports hybrid approach. That means you can use host database for some tenants and create dedicated databases for some other tenants. Even you can group some tenants in a separated database. 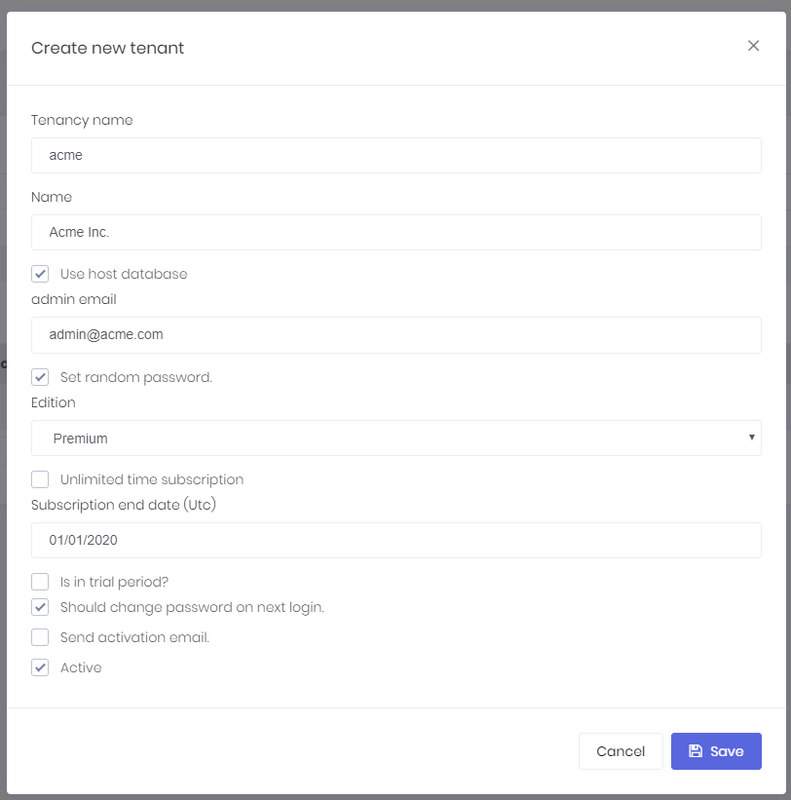 Once you assign an edition to the tenant, you can select an expiration date (see edition management section to know what happens after subscription expiration). TenantAppService mostly uses TenantManager domain service for tenant operations. As a host user, we may want to perform operations in behalf of a tenant. In this case, we can click the "Login as this tenant" button in the actions. When we click it, we see a modal to select a user of the tenant. We can select any user and perform operations allowed that user. See User Impersonation section in this document for more information. A multi-tenant application generally uses subdomain to identify current tenant. tenant1.mydomain.com, tenant2.mydomain.com and so on. ASP.NET Zero automatically identify and get tenant name from subdomain (See host settings section).